Don't let missing teeth, whether from decay or injury, keep you from smiling. Advances in dentistry have lead to improved procedures to replace missing teeth and restore your smile. Whether you are missing one tooth or all of your teeth, there are effective tooth replacement options available, including dental implants, dental bridges, and dentures. At our Red Bank cosmetic dentistry practice, Dr. Michael Bixby offers our patients multiple options to restore missing teeth. Dental bridges are another popular form of tooth replacement. 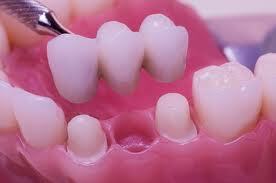 Dental bridges are made to “bridge” the gap caused by a missing tooth or up to three teeth. The bridge, which consists of one to three artificial teeth, is attached to the teeth adjacent to the space of the missing tooth. If the patient has teeth on either side of the bridge, a crown will be placed over each tooth to provide additional support and keep the bridge in place. Dental implants can also be used to attach a bridge in circumstances where multiple teeth are missing. Once the bone has healed around the dental implant the, bridge piece can be secured in place, thus restoring the missing teeth. Dentures are a common option in tooth replacement, especially when a full set of teeth is needed. Traditional dentures are removable and associated with a number of disadvantages. They can be very uncomfortable and are prone to slipping and sliding while eating and talking. This movement can cause pain and allow food to get between the denture and the gums. Implant-supported dentures are permanent restorations that address the problems that patients experience with removable dentures. With implant-supported dentures, the dentures are attached to dental implants secured within the bone. Implant-supported dentures offer stability, comfort, and durability, in addition to the confidence of knowing your dentures will not move while you eat and speak. In addition, because they're securely placed within the bone, you won't have to deal with messy denture adhesives. Missing teeth can be a source of embarrassment. At the practice of Michael Bixby, we offer the latest advances in tooth replacement. We invite you to schedule a consultation with Dr. Michael Bixby for your own personalized treatment plan.